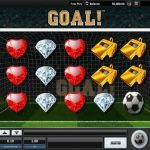 GOAL! 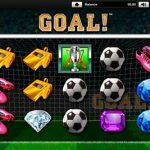 is a video slot game from Realistic Gaming for all you football fans out there. The theme of the game is immediately obvious, with all those symbols and the fact that the reels are placed in front of an empty goal net with the crowd cheering in the background. GOAL! 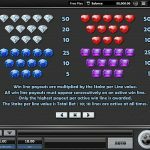 is a very simple 5 reels and 10 pay lines video slot game. There are no special symbols in this game like scatters or wilds but that does not mean that the game should be overlooked. There is one bonus feature which is kind of like a part of the base game which can bring some thrill both to you and to your balance. This feature is activated when each reel contains a stack of matching symbols. And this is what happens here, the reels will flash one reel at a time and it will stop on one of the reels. Then, between one and three symbols on all the other reels will transform to match the selected ones for a guaranteed win. GOAL! is definitely a basic game with an exciting theme. Realistic Gaming did not create this game only for football fans but for everyone who enjoys a nice game play as a matter of fact. The thing that makes this game unique is its creative special feature, which we were surprised to find out it is fairly easy to activate. The betting options are made in that way to suit every kind of a player`s needs. So even if you are a high roller or low roller you can find the perfect bet size for your bank roll. Medium rollers do not have to go to extremes but they can adjust the settings too. For another great engaging game you should consider playing Go Wild On Safari a 5 reel slot by Realistic Games.